10 April 1998 was the saddest day in the history of political unionism. 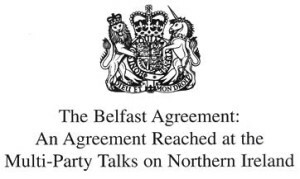 The Belfast Agreement, which was sold to unionists as a settlement, instead breathed into life an expansive ‘process’ which is in of itself a Trojan horse for Irish nationalism. Entwined with this process was peace, creating the moral blackmail at the heart of the Belfast Agreement which subtly suggests that in order to have peace, you must support the ‘process’. This has been combined into one of the great linguistic deceptions at the heart of the Belfast Agreement, a simple phrase known as the ‘peace process’. Peace is an absence of violence, so by explicitly linking it to the ‘process’, proponents of the agreement cleverly created the situation whereby opposition to the process would be equated with opposition to peace. So where does this ‘peace process’ end. That is perhaps the most logical question, that has been illogically avoided for 20 years. It is therefore clear that a process, by its very definition, works towards a particular end. So to interpret the end of the peace process, one must look at the legal framework underpinning it, namely the Northern Ireland Act 1998. The Northern Ireland Act provides for only one referendum, that which poses the question on whether the majority of persons are ready to join a United Ireland. This referendum continues in seven year cycles until such times as the answer is in the affirmative. It is at this point that the process ends. It is here that the absurdity of any unionist supporting the process, which is a by word for the Belfast Agreement, is laid bare. Everyone should support peace, which in practical terms is the absence of violence and support for the rule of law. That should be a given. By pretending that such a peace is dependent upon acquiescence the process, society effectively gives a veto to those that would use violence to advance political aims. How morally perverse is that? Today we will hear people like Tony Blair regale us with high tales about the remarkable Belfast Agreement, about the hand of history. Of course this ridiculous remark wasn’t off the cuff or unguarded by the then Prime Minister, it was a clever attempt to elevate a political deal to a divine level. It is for similar reasons we had the Belfast Agreement christened the ‘Good Friday Agreement’ almost immediately, the religious connotations designed to give a mere political policy and agreement the status of a holy writ. It is due to this sacrosanct cloak that has been thrown around the Belfast Agreement that all sorts of unjustifiable and immoral concessions have been lavished upon republicans in order to ‘protect the peace process’. The Belfast Agreement at its core rewarded the politics of hostage, rewarding ceasing terrorism with political concessions, therefore it is no surprise that the same tactics have pervaded throughout the entire process. Today we will also see people like Gerry Adams swan the stage as peace makers. Gerry Adams was not, and is not, a peace maker. He is a ruthless terrorist that sought to tactically trade in the use of violence in order to achieve political concessions. There was no road to Damascus for Sinn Fein and the IRA, simply a change in tactics. There may be some unionists in 1998 that believed that the Belfast Agreement was the only way to secure peace, and that it would finally provide a lasting settlement for the people of Northern Ireland. Who could fault them for trying if they genuinely held such a belief? The problem is that nationalism never saw the agreement as a settlement, just a staging post in the process. It is my personal view that unionism must consistently make clear full and unambiguous support for peace and a complete absence of violence. That is the only way forward. However, it would be foolish to fail to see the trajectory of the ‘process’. It is time to champion peace, but to robustly challenge the process in the form of using every opportunity possible to undermine the Northern Ireland Act and to seek at the very least amendments, if not the outright repeal of that legislative mechanism. The first step is to ensure there is no return to the status quo. That means no return to mandatory coalition. When mandatory coalition falls, the Belfast Agreement falls. That is the big prize for unionism. So today, 20 years on from the saddest day in the history of political unionism, we must commit ourselves to undoing the mistakes of the past 20 years and instead building workable and durable devolution. 144 Responses to "OPINION: Time to commit to peace but robustly oppose the Belfast Agreement ‘process’"
getting experience daily by reading such nice articles or reviews. and understand this side of your story. It’s surprising you aren’t more popular because you most certainly possess the gift. inspired! Extremely useful info specifically the final part 🙂 I handle such information a lot. to read more of your useful info. Thanks for the post. I’ll certainly return. Normally I don’t read post on blogs, but I wish to say that this write-up very pressured me to try and do so! Pretty element of content. I just stumbled upon your website and in accession capital to say that I get in fact enjoyed account your blog posts. Any way I will be subscribing in your augment and even I success you get admission to persistently quickly. Thanks a bunch for sharing this with all people you actually understand what you’re speaking approximately! Bookmarked. Please additionally consult with my site =). We will have a link exchange arrangement between us! a quick visit this weblog, Keep up the fastidious job. I do love the manner in which you have presented this concern plus it does present me a lot of fodder for consideration. Nonetheless, from everything that I have seen, I really wish when other responses pack on that people stay on issue and in no way embark upon a soap box involving some other news of the day. Anyway, thank you for this exceptional piece and while I can not really go along with this in totality, I respect your viewpoint. With havin so much content do you ever run into any problems of plagorism or copyright infringement? My site has a lot of completely unique content I’ve either created myself or outsourced but it appears a lot of it is popping it up all over the internet without my permission. Do you know any solutions to help reduce content from being ripped off? I’d certainly appreciate it. I used to be very happy to seek out this net-site.I wanted to thanks for your time for this glorious learn!! I definitely having fun with each little bit of it and I have you bookmarked to check out new stuff you blog post. My spouse and i felt quite thankful when Chris could carry out his analysis through your ideas he obtained while using the weblog. It’s not at all simplistic to just happen to be freely giving information which often people today could have been making money from. And we discover we now have the website owner to appreciate for that. All the illustrations you made, the easy blog menu, the relationships you will help to promote – it is all amazing, and it’s facilitating our son in addition to us do think that topic is awesome, which is extraordinarily mandatory. Thanks for all the pieces! Howdy, I think your blog may be having internet browser compatibility issues. Hi there, I discovered your website by way of Google whilst searching for a similar subject, your website came up, it seems to be good. I’ve bookmarked it in my google bookmarks. regular basis, this site is truly nice and the viewers are in fact sharing pleasant thoughts. I’d never understand. It sort of feels too complicated and extremely extensive for me. Your content is excellent but with images and videos, this site could certainly be one of the most beneficial in its field. My brother suggested I may like this web site. He was entirely right. This submit actually made my day. You can not consider simply how a lot time I had spent for this information! Thanks! I do love the manner in which you have presented this problem and it really does provide us a lot of fodder for consideration. However, coming from what precisely I have seen, I just trust as the actual feed-back stack on that people remain on point and not get started upon a tirade of some other news du jour. Yet, thank you for this outstanding point and though I do not necessarily concur with this in totality, I value your viewpoint. Hello my friend! I wish to say that this article is awesome, nice written and come with approximately all vital infos. I’d like to peer extra posts like this . Its such as you learn my mind! You appear to know so much approximately this, like you wrote the book in it or something. I think that you just can do with a few to pressure the message house a little bit, but other than that, that is excellent blog. An excellent read. I’ll certainly be back. Great blog! Do you have any hints for aspiring writers? I’m planning to start my own website soon but I’m a little lost on everything. Would you recommend starting with a free platform like WordPress or go for a paid option? There are so many choices out there that I’m totally confused .. Any tips? Many thanks! Hello.This article was extremely fascinating, especially because I was looking for thoughts on this topic last Saturday. Hello.This post was extremely remarkable, particularly since I was searching for thoughts on this subject last Tuesday. Thank you a lot for giving everyone such a splendid chance to read critical reviews from this blog. It is always so great and jam-packed with a great time for me and my office mates to search your site really 3 times in one week to learn the new items you have got. And lastly, I am also actually amazed with all the extraordinary hints served by you. Some 3 points in this post are completely the most impressive we’ve had. Hey there! I’ve been following your weblog for a long time now and finally got the bravery to go ahead and give you a shout out from Humble Tx! Just wanted to say keep up the good work! What’s Taking place i am new to this, I stumbled upon this I have found It absolutely useful and it has helped me out loads. I’m hoping to give a contribution & assist different customers like its aided me. Great job. It’s in reality a great and helpful piece of information. I’m satisfied that you shared this helpful information with us. Hey very cool site!! Guy .. Excellent .. Superb .. I will bookmark your web site and take the feeds additionally…I’m satisfied to search out so many useful information right here in the post, we need develop extra strategies in this regard, thank you for sharing. . . . . . I am now not positive where you’re getting your info, however good topic. I must spend a while learning more or figuring out more. Thanks for great information I used to be searching for this information for my mission. I’m often to blogging and i really respect your content. The article has really peaks my interest. I am going to bookmark your website and preserve checking for brand new information. Hello, I think your site might be having browser compatibility issues. When I look at your blog in Chrome, it looks fine but when opening in Internet Explorer, it has some overlapping. I just wanted to give you a quick heads up! Other then that, excellent blog! Along with almost everything which seems to be building throughout this particular area, many of your viewpoints happen to be quite radical. However, I appologize, but I do not give credence to your whole idea, all be it stimulating none the less. It looks to me that your remarks are generally not totally validated and in actuality you are generally yourself not completely convinced of the assertion. In any case I did enjoy examining it. Hello exceptional blog! Does running a blog similar to this require a large amount of work? After study a couple of of the weblog posts in your website now, and I really like your means of blogging. I bookmarked it to my bookmark web site checklist and will probably be checking again soon. Pls check out my web site as properly and let me know what you think. super quick for me on Chrome. Exceptional Blog! fastidious to read this web site, and I used to visit this web site everyday. It’s amazing in favor of me to have a web site, which is useful in support of my experience. Hi friends, fastidious post and pleasant urging commented here, I am really enjoying by these. Howdy, I believe your web site could be having internet browser compatibility issues. magnificent post, very informative. I’m wondering why the other experts of this sector do not realize this. I was pretty pleased to discover this great site. I wanted to thank you for your time just for this wonderful read! !